Sometimes it’s on point (I’m thinking Number 1 Noodle House) but other times it just doesn’t make sense. Fortunately, the silent majority have rescued the worthy and I’m thankful. I can’t imagine this city without Santouka’s toroniku ramen, the fabulous ramen egg from Marutama and Taishoken’s tsukemen; all places that have drawn the ire of the first in and angry out ramen ragers. In this sense, Gyoza Bar may simply be going thru a rite of passage that a lot of ramen shops have to in the city. I was fortunately to attend the family and friends dinner before they opened for my freelance work for the Vancouver edition of Eater.com (R.I.P.). I chose not to write a review for my blog at that time because I knew there would be lots of changes and adjustments but I was impressed with the quality and innovation at that time. Fast-forward 2 months and despite the low ratings, I was eager to head to Gyoza Bar with Speedy to do a proper review. Since the place is called Gyoza Bar + Ramen, our meal consisted of ramen and gyoza mostly. I was particular eager to try the Teppan Gyoza because there was a key issue during my first experience: the gyoza was clingier to the imono pan than a Kardashian to notoriety. I was happy to see the kitchen had fixed the problem and each Teppan gyoza could be picked out of the spiral arrangement intact and unmarred. This variation of gyoza was served with two sauces: spicy garlic soy (right) and the umami soy sauce (left). Despite being spicy, I was preferred the garlic soy dipping sauce as it was more interesting. Each dumpling was extremely juicy. The filling had a smooth texture which I preferred since it’s what I grew up with. The flavour was good and there was a golden brown crisp to the dumplings. 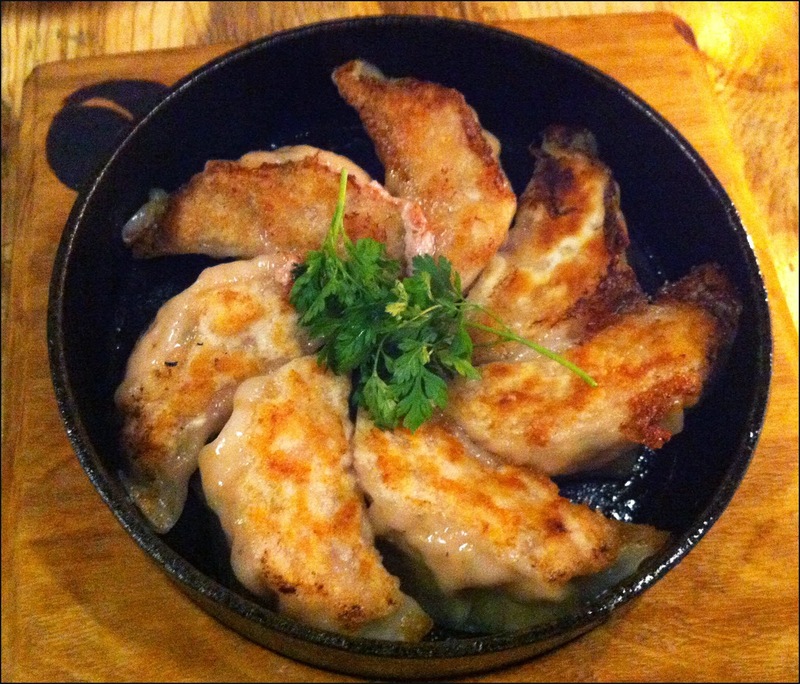 I think these pork gyoza are very good but not extraordinary. Beautifully plated, the Chili Shrimp gyoza was the dumpling I preferred. Much like the Teppan gyoza, the shrimp version was extreme juicy. When you combine all the components of the dish the bite is bursting with flavours: salty (ikura), sour (pickled diakon), sweet (shrimp filling) and spicy (wasabi chimichurri & filling). Being a wonton connoisseur, I wish the shrimp in the gyoza had a stronger pop of sweet umami flavour as it seemed a bit dull but other than that I really enjoyed this dish. I decided to get the small version of the Kaisen Tomato ramen as I had issues finishing the regular size in my previous visit. 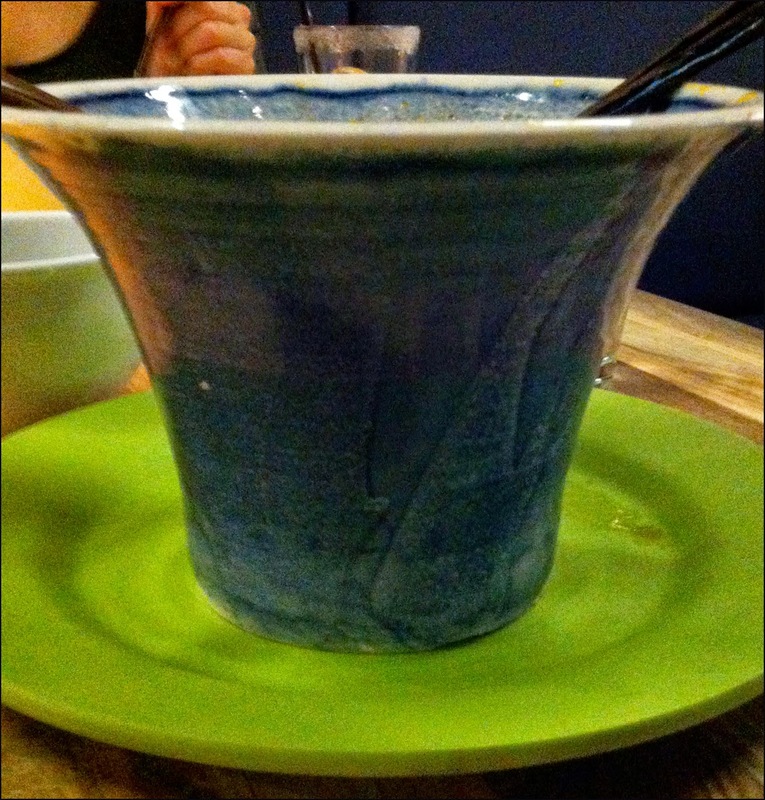 The bowls used by Gyoza Bar, which remind of me of Salish hats, are a little deceptive. They are exceptionally deep which allows them to hold more food than one would think. I believe a small version is available for every ramen and is $3 less than the regular price. I was curious to see what this difference was in terms of the volume of food. From what I recalled, the small Kaisen ramen has one less piece of each type of seafood (scallop, prawn, in shell mussel and clams), sous-vide chicken cha siu and stalk of broccolini. As for the noodles, it’s a long the lines of Santouka as I can easily finish their offering and had no issues this time around. 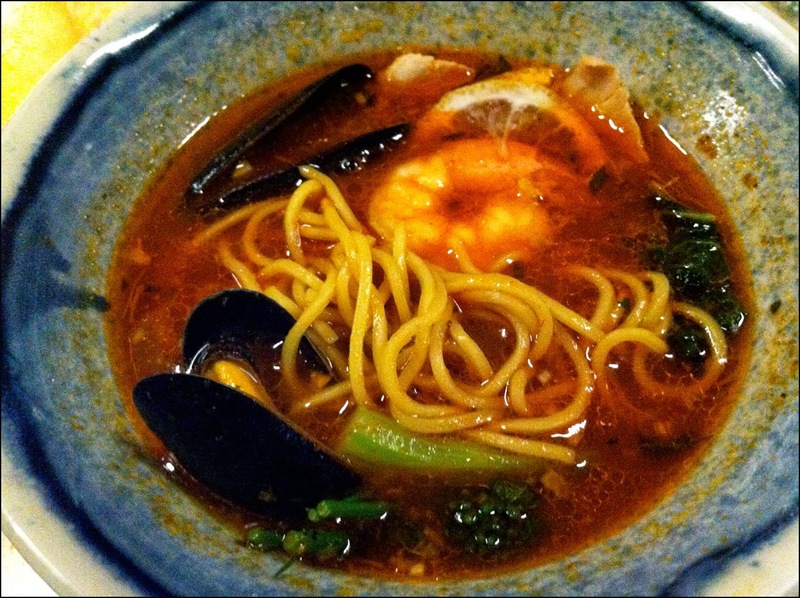 I loved this bouillabaisse inspire ramen before and nothing has changed my mind. 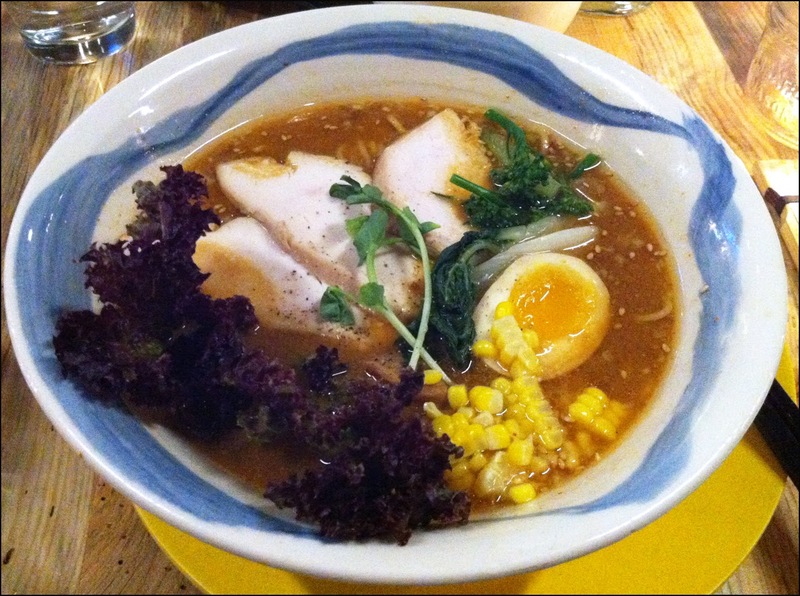 For me, the soup is the most critical element of a noodle soup and in the Kaisen ramen it is wonderful. The garlicky tangy broth had a deep bold umami flavour. You just want to keep on slurping the soup and the noodles. In addition to perfectly cook seafood, my order came with two pieces of sous-vide white meat chicken cha sui. Sous-vide is one of the few cooking methods I’m aware of that consistently produces extremely juicy, flavourful and tender white meat chicken. The chicken cha sui was fantastic, exemplifying the amazing result the sous-vide technique can achieve. Lastly, a small side bowl was brought to table for the shells of the seafood which wasn’t deployed on my first visit. Speedy went with the regular sized Awase Triple Miso ramen. I was able to sample a few spoonfuls of the miso infused chicken broth and I liked it. It was aromatic, sweet and savoury. One of the knocks I have against miso ramen is that the soup often just ends up being overwhelmingly salty. The soup based used at Gyoza Bar is complex tasting. This bowl of noodle also featured the same chicken cha sui as my ramen and Speedy really like it. Speedy barely managed to finished her ample order and was impressed with it. What’s a meal without dessert? We shared the Yuzu Komichi, which looked like a deconstructed Japanese cheesecake to me. It had a creamy yuzu infused filling, small little sweet biscuits and cactus pear shaved iced and a fruit sauce. Like a lot of Asian desserts, the Yuzu Komichi was not overly sweet and relied on the fruit components as the main flavours of the dessert. It was a nice refreshing way to end the meal. 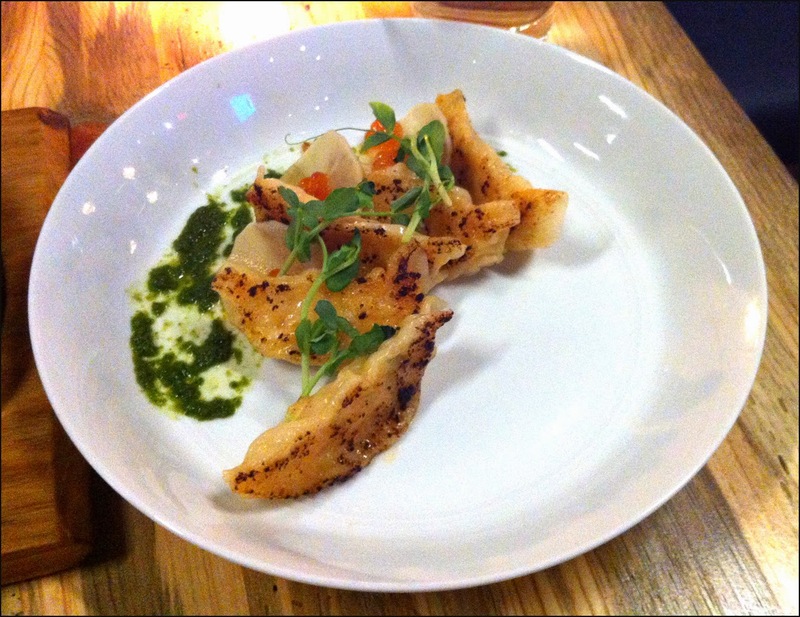 I’m more impressed with ramen than the gyoza served at Gyoza Bar. In fact I think the restaurant should think about switching around its name to Ramen Bar + Gyoza. I really appreciate how the restaurant is pushing the boundaries of ramen and gyoza with different fillings and soup bases beyond the traditionally conceived idea of what those items are. Without eateries trying innovative things, cuisines become stagnant and average. Greek food in Vancouver would be a great example of a boring cuisine in the city. Also, based on the first pre-open dinner to my recent visit, the restaurant should get kudos for making adjustments to improve their food and service. The ramens at Gyoza Bar are fantastic and should be experienced. I sincerely hope the silent majority will come throw this new ramen-ya a life preserver from the negative reviews. Bonus Content: Below is the ramen episode of “The Mind of a Chef” where Chef David Chang explores ramen in Japan. It features Tsukemen and a place serving ramen noodle shaped like lasagna noodles. I can only imagine the epic rage that would happen if those lasagna sized noodles were served here in a Vancouver ramen-ya.